will Sapphire Medallion reduce my X cost on blue spells? Blue spells you play cost (1) less to play. I like this deck and will continue to like it until I end up having to play against it. However, you call this a budget deck, yet you are running Sapphire Medallion , which, while a great card, is $8 for just a ramp piece, which seems out of place in a budget deck. I'm also not sure how efficient Mana Leak is in a format like commander. 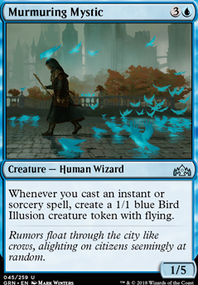 I also noticed that you are not running Counterspell (and Cancel is the exact same thing when Baral is out). Forgot to mention: Pearl Medallion and Sapphire Medallion . BTW, sorry about the first comment being so long and I love the deck. 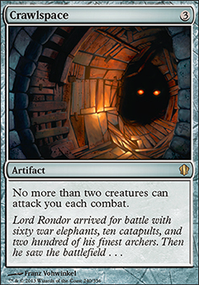 Cyclonic Rift is one of Blue's signature cards in Commander, and for good reason. In the early game, it is a nifty removal spell; in the late game, it wins you games. Sol Ring , Sapphire Medallion , and other artifact ramp spells would be a strong inclusion, particularly given your commander's casting cost. I would cut Astral Cornucopia --too much mana for too little effect. For card draw, you could add some cantrips (one mana draw spells), such as Brainstorm , Ponder , Opt , and others. Nykthos, Shrine to Nyx is probably a good option even though you have a large number of colourless permanents. Kumena's Awakening - I do not think your deck is wide enough to really abuse ascend, and you generally will want card draw immediately, not at the beginning of your next upkeep. Acquire costs a bit much for a fairly dicey reward. Rhystic Deluge puts you in a bidding war with an opponent--I think it is far too much risk, particularly in multiplayer when you're burning resources to stop only one opponent. Helm of Awakening also helps your opponents as well as yourself, and they generally will benefit from its ability before you do. Hey, High Tide is too good in monoblue with all Islands. Many instants allow you to untap lands and these budget cards are great with Tide: Frantic Search , Turnabout , Rewind , Unwind , Snap . Having cards that can tutor for Tide are helpful: Mystical Tutor , Spellseeker , Merchant Scroll . If you're able to splurge for one card get Mystical because it's so versatile instant for one mana that can be recurred. Blue Sun's Zenith and Pull from Tomorrow are draw spells which you can put a ton of mana into thanks to Tide. Budget mana rocks to consider: Sol Ring , Mind Stone , Everflowing Chalice , Fellwar Stone , Prismatic Lens , Wayfarer's Bauble , Gilded Lotus . Thought Vessel is another one and it's very good, but not budget even though it's a damn common. 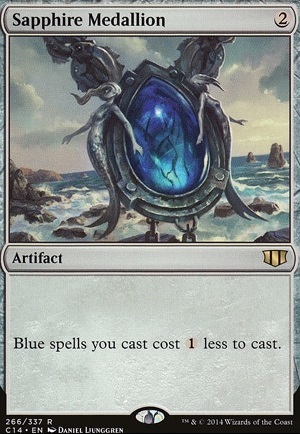 Sapphire Medallion and Baral, Chief of Compliance are not mana rocks, but they're two drops who can reduce the mana cost of most of the rest of the spells which is just as good, but they may be too much for the budget here. Other cards to consider: Ponder , Brainstorm , Preordain , Serum Visions , Mystic Remora , Mystic Confluence . High Tide Talrand (Budget) is my $160 Talrand deck. Maybe it can give you some ideas, feel free to use it as inspiration. I want to point out that cost reducers, such as any of the Medallions: Sapphire Medallion , will trigger Lavinia if it reduces the cost to zero. 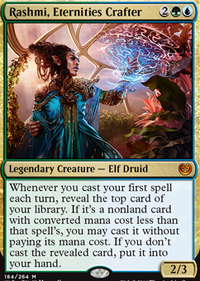 However, the kicker here is any spell increase due to taxing effects such as Thalia, Guardian of Thraben means "free spells" can now be cast because mana was spell to cast them. Cascading into spells with Sunbird's Invocation or Maelstrom Wanderer will circumvent the Lavinia trigger as long as the opponent as the land criteria. After testing with with this deck, Omen Machine is really bad compared to other effects, such as cards like Eye of the Storm . Consider this, exile Expropriate with Eye of the Storm and then take everything every time you cast a spell for the rest of the game using Eye or have unlimited Teferi's Protection because these cards are exiled when they are cast, prior to them resolving. Creatures are still an issue, but that is why you still play Knowledge Pool. You can also stack the triggers in such a way that cards that cannot be countered don't get out from under Knowledge Pool, such as Abrupt Decay . Well for starters you should show us this list you have, I can't find anything from your profile/deck folders because you had none, so you should use this page to submit a decklist for us to see what you had. In the meantime, also consider checking out the site edhrec.com where you can find out a lot of commonly used cards for various commanders. 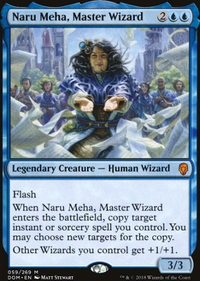 You want plenty of instants such as Counterspell , Disallow , Rewind , Serum Visions , Brainstorm , Opt , Anticipate , Preordain , Swan Song , Cyclonic Rift , Jace's Sanctum , Sapphire Medallion , Thought Vessel , Isochron Scepter and last but certainly not least Baral, Chief of Compliance , are all popular cards. Your lands can be kept quite simple with just a lot of Island s, but there's one's like Remote Isle , Reliquary Tower , Myriad Landscape , Halimar Depths , Lonely Sandbar , Temple of the False God , that you can use too. Being just one colour, with likely a good number of Island s you can take advantage of Caged Sun too.